This cross stitch stamped sampler shows three Santa's on their way to drop off gifts under the Christmas Tree.With a cheerful smile each Santa has a different gift. 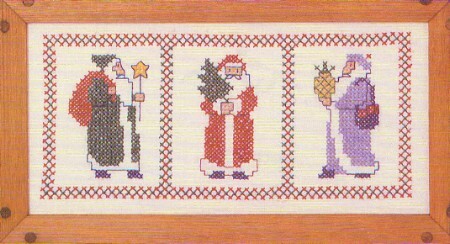 A printed cross stitch craft kit that displays Santa's in various phases of movement towards a worthy house, with each wearing a different color coat. This Christmas craft kit compliments 405/Small cheerful Santa's.